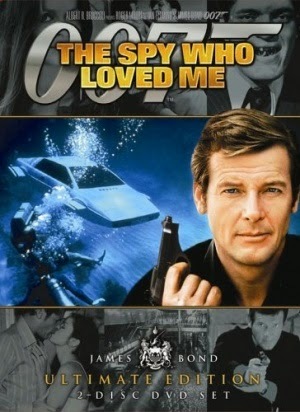 The film takes its title from Ian Fleming's novel The Spy Who Loved Me, the tenth book in the James Bond series, though it does not contain any elements of the novel's plot. The storyline involves a reclusive megalomaniac named Karl Stromberg, who plans to destroy the world and create a new civilisation under the sea. Bond teams up with a Russian agent Anya Amasova to stop Stromberg. Curd Jürgens and Barbara Bach co-star. Barbara Bach as Anya Amasova/Agent Triple X: A Soviet KGB agent also investigating the theft. Her attraction to Bond is cut short when she learns he killed her lover. Bach was cast only four days before principal photography began, and performed her audition expecting just a role in the film, not the one of the protagonist. Curd Jürgens (billed as "Curt" in the credits) as Karl Stromberg: The main villain, a megalomaniac planning to trigger World War III and destroy the world, then recreate a new civilisation underwater. Jürgens was cast on a suggestion of director Lewis Gilbert, who had worked with him before. Richard Kiel as Jaws: Stromberg's seemingly indestructible juggernaut of a henchman, afflicted with gigantism and having a set of metal teeth. He would reprise the role in the subsequent Bond film, Moonraker. Caroline Munro as Naomi: Stromberg's personal pilot and a would-be assassin. Munro's casting was inspired by an advertisement campaign she had made. Walter Gotell as General Gogol: The head of KGB and Anya's boss. Gotell's debut in the role; he had previously appeared in From Russia with Love and would reprise the role of Gogol in the subsequent five films. Desmond Llewelyn as Q: MI6's head of research and development. He supplies Bond with unique vehicles and gadgets, most notably the Lotus Esprit that converts into a submarine. Geoffrey Keen as Fredrick Gray: The British Minister of Defence. Keen's debut; he would appear in the role in the subsequent five films. Edward de Souza as Sheikh Hosein: Bond's contact in Egypt, who was at Cambridge with 007. The assistant director for the Italian locations, Victor Tourjansky, had a cameo as a man drinking his wine as Bond's Lotus emerges from the beach. As an in-joke, he would return in similar appearances in another two Bond films shot in Italy, Moonraker and For Your Eyes Only.